Large Format Display Rental & Info! 24 May Large Format Display Rental & Info! Large format displays (LFD’s) are everywhere! From schools and reception desks to conference centres and exhibitions LFDs are the perfect way to showcase media, advertisements and presentations in any business. In the post we’ll give you some info on what LFDs are and what they are ideal for! What is a Large Format Display? Large Format Displays are flat screens that are sleek and minimal in design. They are designed with thin bezels and range in sizes starting from 32” and go up to 90”+. One of the great advantages of large format displays is that they are packed with connectivity options allowing you to connect multiple devices with plug ‘n play ease. Images are large, bright and vivid. 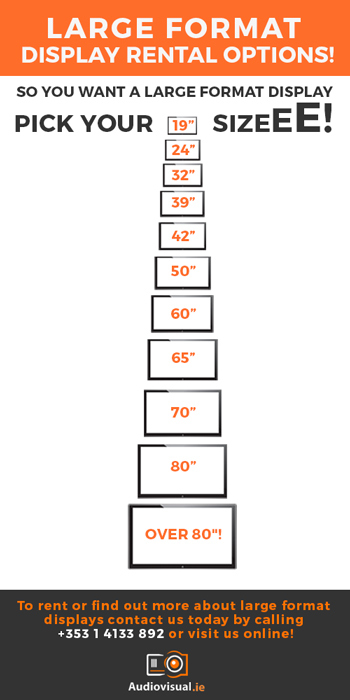 Large format display are either LED, LCD or Plasma technology and can be used to display through a range of connectivity options the most common being HDMI or VGA. More recently, some are also available in touch screen which is ideal if you are using them in an interactive or presentation environment. Why should you rent a Large Format Display? Whether you’re a small or large business, thanks to the versatility of these monitors, your business can use them however you think you will benefit from them the most. They are versatile and most importantly they grab attention. By using large format displays to project posters, adverts or general messages you are engaging with existing and potential customers whenever they walk by, through your premises or enter the building. PowerPoint Presentations look slick and vibrant; software looks sharp and rich in colour. Logos look inviting. Large format displays offer solutions that until now were simply not available. Over the years the bezel (surround) of the displays have got thinner thus increasing the actual viewing area of the display giving corner to corner impact. The slimmer bezels coupled with thinner housing and light weight construction, means that mounting options have also increased considerably. A large format display can be mounted almost anywhere. At Audiovisual.ie, you can choose from a wide variety of large format displays (LFDs) to rent. We deliver, set-up or install and collect the equipment when you are finished with it. We provide standard and touch screen displays, LCD and LFD TV screens, Matrix ID screens, and more. We offer plenty of high quality, dependable rental options. Whether you need an LFD for a trade show, your lobby, office, bar, restaurant or a convention – we can help. If you have a presentation or simply want to gather a crowd, large format displays for rent are a great way to make a memorable impression. We are now offering our new 2X2 Video wall see our previous blog on video wall rental. You can rent large format displays all across Ireland. We’re also happy to offer a variety of technical support options, including custom configuration and software options. We’ll install and remove equipment and even remain onsite if you need us to. All our rentals are or the highest quality and our technicians are available via phone 24 hours a day, 7 days a week to answer any questions. Our rental terms are flexible. Rentals can be for any length. If you wish to discuss options further, call me on 01 4133892, email me directly on ivan@audiovisual.ie or contact us online!